Albrecht Dürer was a master in various media, but it was in woodcut design that his creative genius reached its highest expression. 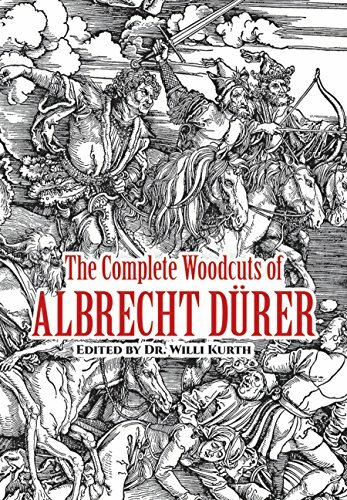 Here are all of his extant woodcuts, a collection of over 300 great works containing all the familiar cuts long treasured by the world's art lovers: the celebrated series on the Life of the Virgin, The Apocalypse of John (17 cuts), The Great Passion, St. Jerome in his Study, Samson Fighting the Lion, The Fall of Icarus, The Six Knots, The Men's Bath, St. Christopher, The Virgin in Glory, The Rhinoceros, The Last Supper of 1523, illustrations from Dürer's "The Art of Measurement" and from his four books on human proportion, and many others, including much little-known material. This book is the only available source for many of these works. Although sacred subjects predominate (the Holy Family, scenes from Christ's life, crucifixion, etc., the lives of the saints, Old Testament episodes), many other motifs are treated. There are portraits of prominent men of the ages, book illustrations (secular and religious), coats of arms, the celestial and terrestrial globes, animals, mythological and historical themes, etc. The plates are arranged generally in chronological order permitting the reader to view the development of Dürer's art. From out of the gnarled figures and landscapes one can see the emergence of an individualistic style and skill unrivaled in this sphere. An introduction by Campbell Dodgson and a 34-page textual guide to the plates by Dr. Willi Kurth discuss the evidence and controversies surrounding the authenticity of each work, citing the opinions of all the important Dürer scholars; they also furnish the reader with the historical background of the cuts and of Dürer's life and times — from the years of apprenticeship in Nuremberg to the last works of 1520–1528. All of the woodcuts are reproduced in excellent detail. This book is indispensable for the professional art historian and critic. To the layman with any aesthetic interests at all it will be a source of stimulation and satisfaction that only great art can provide.